Storylines• The Bulls are 4-0 for the first time since the 1981 season. The last time Buffalo started a season 5-0 was 1980. • The all-time series between Buffalo and Army is tied, 3-3. This is the third time in the last four seasons the two teams will play. • Tyree Jackson is 80 yards shy of becoming the sixth quarterback in school history to throw for 5,000 yards in a career. • The Bulls are the only team in the nation not to have allowed a sack this season. • The Bulls are looking to sweep their non-conference opponents in a single season for the first time in school history. • The Bulls have won seven straight games dating back to last season. It is the fourth longest streak in the country (UCF 16, Ohio State 9, Penn State 8, Buffalo 7, Duke 7). • A win over Army would be the Bulls' first 8-game winning streak since winning eight straight between the 1946 and 1947 seasons. • The Bulls are outscoring their opponents 54-3 in the first quarter of games this season. • Khalil Hodge (324) is four tackles shy of passing Khalil Mack (327) for eighth in school history in career tackles. • Buffalo has scored 31+ points in seven straight wins - the third longest such streak in the country behind UCF (16) and Penn State (8). 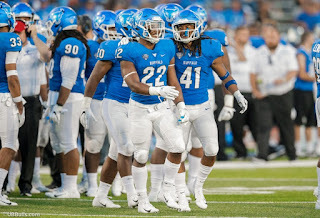 Bulls Host Army West Point in Search of Fifth Straight WinOff to a 4-0 start, the University at Buffalo football team will host Army West Point. The Bulls are coming off a 42-13 win at Rutgers last Saturday. UB was led by junior quarterback Tyree Jackson who threw for three touchdowns and freshman running Jaret Patterson back who rushed for two more. Army West Point is 2-2 on the season and is coming off a 28-21 overtime loss at #5 Oklahoma last Saturday. The Black Knights are led by quarterback Kelvin Hopkins, Jr. who has rushed for 308 yards and four touchdowns and thrown for 460 yards and two scores. The all-time series is tied, 3-3. The Black Knights won the last meeting, 21-17, last season at Michie Stadium. Bulls Make History in PiscatawayBuffalo defeated Rutgers, 42-13, on Saturday at HighPoint.com Stadium for its first-ever win over a team from the Big Ten Conference. The Bulls were 0-7 against Big Ten opponents prior to Saturday's win. It was also UB's first win over an opponent from a Power 5 conference. Buffalo's win over Rutgers was one of the largest by a MAC school over a Big Ten opponent in conference history. T3Quarterback Tyree Jackson is off to a blistering start to the season, having already thrown 15 touchdowns, three more than he did all of last season. He already ranks 10th in school history for single season passing touchdowns. Jackson has really found his groove since the end of last season. Over the last eight games, he has thrown for 2,415 yards, (63 comp.%), 24 touchdowns to only five interceptions. Jackson's 15 touchdown passes on the season is tied for third in the nation. He was named the Mid-American Conference East Division Offensive Player of the Week in each of the first two weeks of the season. Former UB running back James Starks is the only other UB player to earn player of the week honors in consecutive weeks back in 2007. Jackson is on the preseason watch lists for the Davey O'Brien Award and Johnny Unitas Golden Arm Award. Long Way HomeThe Bulls have been using big plays to find the endzone this season. 10 of the Bulls' 23 touchdowns on the year have been at least 22 yards. The Bulls have scored touchdowns of 27, 32, 33, 22, 29, 70, 75, 42, 42 and 53 yards over the first four games. Chuck WagginChuck Harris continues to develop into a monster edge rusher for the Bulls. Over the last seven games, Harris has seven sacks and 10 tackles for loss. Not bad for a young man who only started playing football his junior year of high school. Harris' five sacks this season leads the MAC and has him tied for third in the nation. Setting the Tone EarlyWhile the Bulls have been putting up big numbers on the scoreboard, they have been doing much of their damage in the first half. Buffalo has scored 28 or more first-half points in three of its first four games. UB has led at the half in every game this season while averaging 27.5 points over the first two quarters. The Bulls rank second in the MAC in scoring, averaging 40.2 points per game. The Kids Are AlrightWhile many will credit the Bulls' hot start to their seasoned veterans, you can't discredit the play of the youngsters. Nearly half of Buffalo's 23 touchdowns (11) on the season have been scored by freshmen. Buffalo's top two leading rushers are freshmen. Redshirt-freshmen Kevin Marks leads the Bulls with 282 yards and five touchdowns. True freshman Jaret Patterson has rushed for 175 yards and three scores. Redshirt-freshman Charlie Jones has seven catches for 166 yards (23.7 ypc) and is tied for second on the team with three touchdown receptions. Os-born to RunK.J. Osborn had one of the best games of his career against Eastern Michigan. The junior receiver had seven receptions for 188 yards and three touchdowns in the Bulls' 35-28 win. Two of Osborn's three touchdowns were 70+ yards (70, 75). He was rewarded by being named the MAC East Division Offensive Player of the Week. Osborn is enjoying the best start to a season in his career. He leads the Bulls with 19 catches for 328 yards and five touchdowns. He's tied for sixth in the nation in touchdown catches. Khalil Hodge recorded his 300th career tackle against Eastern Michigan on Sept. 15 to become the fastest player in school history to reach 300 tackles. He did it in 27 games. Davonte Shannon, the Bulls all-time leader in career tackles with 461, didn't reach 300 tackles until his 34th career came. No player in college football had more tackles than Hodge over the last two seasons. He totaled 277 tackles over the last two years, including a career-best 154 stops in 2017. It was the most tackles by a UB player in the program's FBS era (since 1999). Hodge ranked second in the nation in tackles in 2017. Hodge was named the MAC East Defensive Player of the Week after his 15-tackle performance in UB's win over Rutgers. Off to a Good StartThe Bulls have outscored their opponents 54-3 in the first quarter of games this season. A field goal by Rutgers accounts for the only points Buffalo has allowed in the first quarter this season. Conversely, the Bulls have averaged 13.5 points in the first quarter this year. However, Buffalo isn't just scoring in the opening quarter. UB has scored in 13 of the 16 quarters on the season. Serve and ProtectThe UB offensive line has done a tremendous job so far this season. The Bulls are the only three team in the nation not to have allowed a sack this year. Buffalo has attempted 128 passes through four games this season. Bulls Receive Top 25 VotesBuffalo received votes in the Associated Press Top 25 on Sunday for the first time in program history. The Bulls also received votes in the coaches poll. The Bulls also received votes in the coaches poll in 2008 and 2013. Marks and RecreationKevin Marks had a breakout performance in the Bulls' win over Temple. The redshirt-freshman running back rushed for 138 yards and two touchdowns in the first significant game action of his career. It was the best performance by a freshman or redshirt-freshman running back since freshman Devin Campbell rushed for 160 yards at Ohio on Oct. 6, 2012. Marks leads the Bulls in rushing with 282 yards and five touchdowns. The Power of 41The Bulls have had a different player wear the #41 jersey in each game this season to honor the late Solomon Jackson. In recent games, the player who has worn the number has had a standout performance. Cornerback Cameron Lewis wore it against Temple and had two interceptions and was named the MAC East Defensive Player of the Week. Against Eastern Michigan, defensive end Chuck Harris wore it and had a career-best 2.5 sacks and a forced fumble. Sharing the WealthTyree Jackson has done a good job distributing the football so far this season. 12 different players have a caught a pass already this year. 13 different players caught a pass all of last season. In addition, six different players have a touchdown catch on the year and four of the six have caught at least two TDs. Cam ToughSenior cornerback Cameron Lewis had a career-best two interceptions in the Bulls' win over Temple. He became the first UB player to intercept two passes in a game since Okezie Alozie had two picks against Ohio in 2015. Lewis has four career interceptions. AJ is OKNot many players in school history made a bigger impact in their first season with the UB football program than wide receiver Anthony Johnson did in 2017. The JUCO transfer had 76 catches for 1,356 yards and a school-record 14 touchdowns last season. He ranked second in the nation in receiving yards per game (113.0) and third in receiving touchdowns (14). The All-MAC First Team selection had six games of 140 or more receiving yards which was tops in the country. Johnson's 1,356 receiving yards were the second most in school history for a single season. He was second only to Naaman Roosevelt who had 1,402 yards in 2008. However, Johnson had 28 fewer catches than Roosevelt. Johnson averaged 17.8 yards per catch compared to 13.5 yards per catch for Roosevelt. Johnson had 21 catches for 468 yards and eight touchdowns over the final three games of the 2017 season. Johnson was named a second-team AP Preseason All-American, becoming the first player in school history to earn the distinction. This season, Johnson has 18 catches for 308 yards and three touchdowns. Watch OutThe Bulls placed a program-record six players on nine different NCFAA award preseason watch lists. Bulls appeared on more preseason watch lists than any other school in the Mid-American Conference. The previous high was four players on eight different watch lists prior to the 2013 campaign. Mitch PerfectKicker Adam Mitcheson is just four made field goals shy of the school record for career field goals made at UB. The senior kicker has made 40 field goals over his career. He is currently second all time, trailing A.J. Principe (2007-10) who made 44 field goals over his career. Mitcheson is also on pace to break the school record for career scoring. The Pittsburgh native currently ranks third in career scoring with 229 points. Principe holds the school record with 265 career points. Team CaptainsThis season, the Bulls will feature two season captains as well as two rotating game captains. Serving as season captains are senior center James O'Hagan and senior linebacker Khalil Hodge. Both O'Hagan, UB's fourth-year starting center, and Hodge, UB's third-year starting middle linebacker, also served as team captains last season. Bulls Add Three Grad TransfersThree graduate transfers from Power 5 programs joined the Bulls prior to the 2018 season. Wide receiver George Rushing, safety Ashton White and offensive lineman Trey Derouen all joined the squad. Rushing came from Wisconsin where he played in 39 games and made one start. He recorded 18 receptions for 208 yards in his career. White came from Notre Dame. He played in six games in 2016 and had a pair of tackles. Derouen transferred to Buffalo from South Carolina. He appeared in one game as a redshirt freshman in 2016. Rushing will have one year of eligibility, while White and Derouen will have two. It's All RelativeThe UB football team features a pair of players related to two of the top five picks in the 2014 NFL Draft. Senior wide receiver Anthony Johnson is the cousin of top pick Jadeveon Clowney. Junior defensive end Ledarius Mack is the younger brother of former UB All-American and fifth pick Khalil Mack. 10-Year Anniversary of MAC ChampionshipThe 2018 season marks the 10-year anniversary of the Bulls' 2008 MAC Championship - UB's first and only football conference title. After a 7-5 regular season, the Bulls stunned 12th-ranked Ball State, 42-24, in the title game. Buffalo went on to play Connecticut in the International Bowl - its first-ever bowl game.